Thank you for sharing your thinking Maria. :) #cawpasi: You can see Maria's blog at http://teachingin21.blogspot.com/. Her Twitter account is @MariaCaplin. 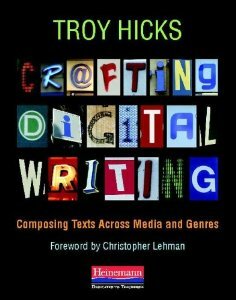 Blogging is where I learned how to apply what I was teaching teachers about writing. I needed to be a writer to have authenticity to my instruction. It is a place I can try different types of writing and build craft into my posts. It is scary putting your thoughts out there, but TWT is the best place to find an audience. Tuesdays and March are my lifeline to writing. It helps me notice details in the world and save them. I tend to use a picture taken from my phone to support my writing and preserve ideas. Have fun with the teachers tomorrow. Can't wait to read about Turkey. Thank you elsie! 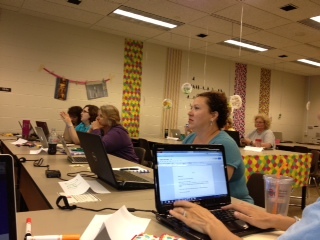 Your blog will be an inspiration to the teachers in our cohort. I'm excited to share your writing. Sorry for deleting, too many typos! Sounds like a good class, Julie. I started blogging over two years ago because I wanted to do more with the writing. I've always written, and written with my students, so started reading blogs, & one was Two Writing Teachers, so inspiring to read what everyone is doing, believes, etc. I am a workshop person, much influenced by Don Graves, Nanci Atwell, Lucy Calkins, & now Ruth & Stacey, Katie Wood Ray, et al, so I thought I had much to share about what I believe, how I teach, etc. I write personally too, about books I'm reading (mostly children's), and participate in Poetry Friday. I also want to capture experiences, with students, out in the world, my life, etc. And I want to capture questions-try to answer but put them out into the world to see what others think (just as you did). I too am going to the All-Write, so tweet @LBaie or check out my blog, www.teacherdance.blogspot.com Hope it's a great week for you! Thank you Linda. One of the things I so appreciate about you is the time you spend making comments on others' blogs. I hope that new bloggers will understand the power in receiving and giving comments. Ive been blogging for about three years now, Julie, and I find it hard to think back to a time when I did not blog. How did I begin? I read lots of blogs to get some ideas about the look and organization of things, then I just began. Slice of Life on Tuesdays, Poetry Fridays, and book review Mondays gave me a structure for the week, and then I filled in with teaching observations and ideas. I try to think of myself writing for an audience, but most of the time my blog is a place to think aloud and jot down notes. It's important to link to other blogs like your own in subject matter, and then to comment. But by bit, day by day, your blog takes on a shape and point of view...it becomes an extension of your writing self and your thinking self. I can't always travel to workshops, or know what has just been published, so the blogging world becomes my PD connection. And, along the way, I've made friends and become part of a community. That's the best part! Here's my blog: http://tmsteach.blogspot.com/. Stop by for a visit! JUST DO IT!!! I remember being nudged by Ruth & Stacey's amazing posts to create my own blog... and then playing around with the design for a couple of weeks while I wrestled with whether or not I could actually do this... and then being ABSOLUTELY TERRIFIED before I pushed "Publish" on my first "Slice of Life" that first Tuesday. - "play" with new genres, styles, topics, etc. My best advice is to link up to a vibrant, positive community like the Slice of Life community so you have immediate support, examples, and authentic connections. Also, start small and do what's right for you -- you don't have to be the blogger that writes every day if that's not who you are! I just realized that you and Jen are part of the same writing project. How neat! I'd also start small. No more than three posts a week. Setting a schedule will help you manage your time and will help your readers know when to expect new content from you. Hope that little bit helps! Thanks for stopping by Stacey. Let's hope we get some new Slicers. :) Love the "pick your poison." I will be honest, when things get crazy busy, my blogging is one of the first things to go by the wayside, but I always regret it later. Blogging is a great way for me to share my thinking about books and about the learning that goes on in my classroom. More importantly, it is a wonderful tool to connect with other educators. I try to spend as much time commenting/having conversations on other blogs as I do writing my own posts. The bloggers I connect with are a personal learning community for me. I learn so much from all the bloggers I follow, and I learn a lot about myself as a writer and an educator when I have to put words on a page as well. Thanks for stopping by. I'm like you. When life gets busy, my blogging comes to a standstill. I guess we all need to find what's right for us. The connections you make through commenting on blogs is so powerful. I hope that I can share that with the teachers tomorrow. I wish I could sneak into the sessions. I learn something every time I am in a room (virtually or otherwise) with #nwp people. As you know, Troy's first book rocked my world. I haven't been the same since. I am looking forward to reading his next one. I am addicted to blogging. I have two blogs and have been better about blogging than any exercise plan I have tried. I wasn't sure I would like it or be able to maintain it, but I have found it the perfect place to reflect. To me, blogging is being part of a conversation. Many of the posts I write connect to conversations across blogs and on Twitter. I try to take time to comment as well. I learn so much reading other blogs and want to contribute to the community. I am amazed by all the smart thinking and collaborative learning happening across blogs. I am glad you are bringing new voices into the conversations. Thanks for stopping by Cathy. I remember when you took the leap. Your voice add so much to the critical conversations going on right now. I, for one, am glad you took on blogging. Julie~ I am so excited for the "Bloggers To Be!" Blogging was possibly the scariest thing I have ever done (professionally). It was also THE one experience that has forever changed my teaching, my understanding and my perspective! I can't imagine life without a blog. -As you read DO leave comments! Audience is what motivates and inspires a blogger, we all like to know someone is reading and we LOVE to learn together! -As you comment share what you like, share connections & ask questions! This is the piece that builds perspectives and pushes the blogger and the reader. -Allow your thinking to change and connect to the blogs you read- allow the posts you read to inspire your teaching and writing—then blog about it! Connecting and building with others has been THE best professional development! -----One simple blog post and one humble tweet began the Global Classroom! ——One post began Poetry Tag! From little things big things grow! The beauty of this in the blogging world is YOU decide how big or small your "little things" will grow! When you write your first post please tweet me @deb_frazier or leave a comment on my blog~ Primary Perspective- http://deb-frazier.blogspot.com so I can learn with you! Thanks for all the links Deb. You are on fire!! Your influence on Twitter and through blogging are inspirational. 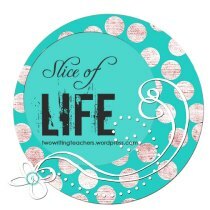 My advice is- “try it, you’ll like it!” I started my blog for the March 2012 Slice of Life Story Challenge. I wrote every day, and I am still writing and posting every Tuesday at Two Writing Teachers. I wrote every day in March again this year. Since I discovered how much I enjoy writing and how much I learn from it, I TAKE time to write, read, and comment. (Sometimes maybe too much!) Ideas seem to come from everywhere- when you write regularly, you notice more, and think about how you could write about what you notice. I have written about a billboard, a report on the evening news, an ad on a truck on the side of the road- ordinary things from ordinary days. I write about my faith, my family, my school, students, and colleagues, my friends, my memories- the things that are most important to me. You get ideas from what you read, especially as you read what others in the writing community are writing. I found I like to write poems (surprise!) and from other SOLSC writers, I’ve learned about and tried many poetry forms- book spine poetry, villanelle, arun, and triolet- and I keep trying to write the perfect haiku. Sometimes you just start writing about “having nothing to write about” and it turns into something, or you start writing a list and are amazed when it becomes “real writing.” The great thing about blogging is becoming a part of a writing community. You “meet” writers you love to read because you have so much in common and writers you love to read because their experiences are so amazingly different than your own. Through reading and commenting on each other’s writing, you come to feel as if you know each other. People connect to the content of your writing in meaningful ways that are personally encouraging. And through comments, you get feedback that helps you grow as a writer. Thanks for stopping by. Your comment about writing about having nothing to write about made me smile. The SOL community is so great, isn't it? Julie (and all who have posted comments) ... thank you for the inspiration to just take the plunge! Hi! Sorry this is late. Hopefully your day with blogging and bloggers went well! I really started getting into blogging after participating in the SOLC 2012! And then joining in on twitter last year brought blogging to another level-I have learned so much through connections made at TWT! I am grateful to have learned with the community! Join a like minded community for support and comfort-connecting with others is the best way to begin!